Ok, I thought I had been down every aisle of Home Depot...guess not. Roofing! Can you believe it and look at the package. It was SCREAMING to me from the shelf. The label says 5" x 7"...first thing I thought of...frames. Then further down on the label it says Hobbies/Crafts. Do they know we shop here now? I hope not, because they'll raise the prices if they know we love it. 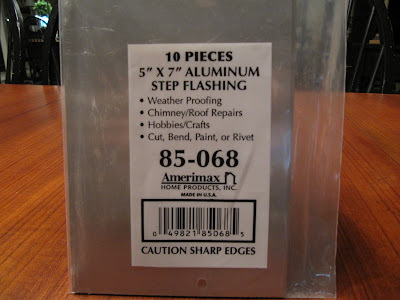 This package was $2.38 for 10 (yes 10) pre-cut pieces of aluminum. That's about 24 cents each. Here's what to do with it. Find an old frame that is 5" x 7" (and use black marker to color in that chip in the upper right hand corner). Remove the glass. 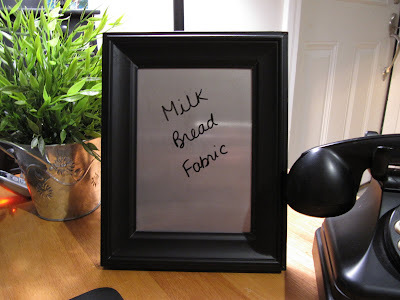 Well, it's a mini dry erase board of course. Perfect for next to your desk, on your kitchen counter, on the little table in your foyer on the way out the door, in your child's locker at school, wherever you need a little reminder or want to leave a little love note for someone. Shopping lists...3 essentials for a New England snow storm!! This is a local joke, but when it snows here, the stores sell out of all milk and bread...it's crazy. The last one (fabric) is my essential. 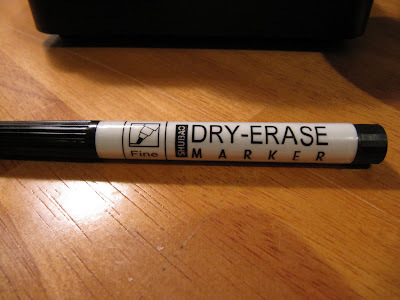 You just need a dry erase marker. 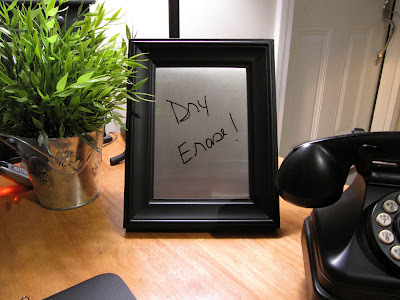 If you don't use a dry erase marker...the list you made will be permanent!! Here's another quick tip that I just came up with after using my index finger as the eraser (don't do that). I had a bunch of black pom poms, so I hot glued one to the end of the dry erase marker to clean the board. If I put eyes on that thing it could be a Muppet character. 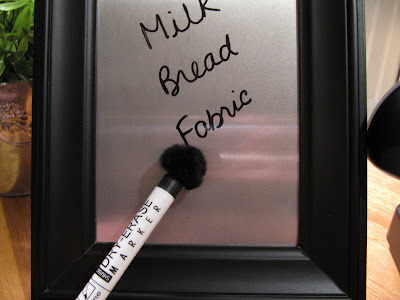 Wouldn't it be cute to match the frame, marker and pom pom to the room you are using this in. 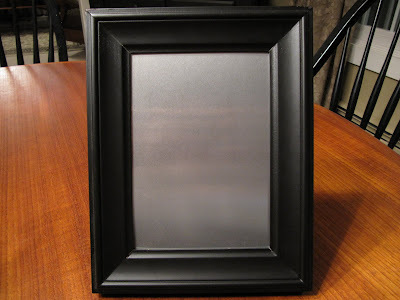 I'm also thinking a larger frame with a mat that has a 5" x 7" opening. You could cover the mat in fabric to match your decor. If it wasn't 11:55 pm Monday night I would make one to show you. I'll add that to my Wednesday Day Off "to do" List. I am smiling on this one.....only you could think of something so clever!!! the pom pom was just the icing on the cake!! Another Clever Idea!! Don't worry I won't tell anyone at Home Depot or Lowe's that crafters go shopping there. What a great idea and of course I'll have to go to Home Depot and check out the supplies. Dern it! And I was at Home Depot tonight!!! You are amazing! Thanks for the great tip. I'm thinking little Valentine's gifts for teachers and my high schoolers! How clever! Especially the pom pom eraser! Your imagination just amazes me. How clever is THAT? Too cool. Didja happen to check to see if a magnet would 'stick' to it, too? Dual duty! your idea is great, like always and I LOVE the pompon!! Cute idea! BTW - in PA, when there is a chance of snow, everyone buys bread, milk and eggs. If it doesn't snow I guess everyone eats a lot of french toast!! Karen - I recently found your blog and have to say you have the most wonderful ideas. 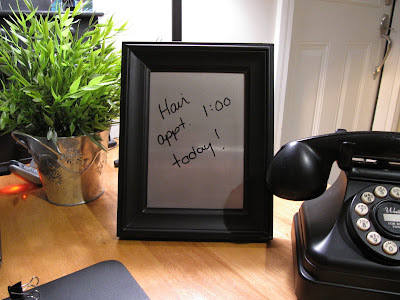 I look forward to your 'Tool Time Tuesdays' and this dry erase board is another lovely project! Thanks for the great idea. I was looking for Birthday gift ideas and this will make a good add on to any smaller gift. Super-d-duper! Hubby and I were just at our local all purpose store and I was explaining to him what I wanted to get - I was in the heating section he directed me to another section where they came in sheets (a bit spendy) - I told him why do I want to spend that much when I can spend pennies.... Now I can't wait to get out of town and to the larger stores with a roofing dept... He'll be surprised :) Thank you! Tuesday's have become my favorite day of the week now that I have found your blog and Tool Time Tuesdays. You are so clever yet your ideas are very easy to do. Thanks for sharing your creative mind! Clever, clever! The black pom pom idea was the best! Love it! And the pompom idea is pure genius! Love it ,wouldn't these be fun to dress up for teen girls . You should title your blog, "The Inventor for the Modern Woman"
You've done it again! Love it, I headed to the attic for a pic frame right now! You clever girl, I have been lamenting all these scraps of paper laying everywhere. (my constant notes) Now there's a pretty way to be reminded. Es alucinante, todo lo que aprendo contigo. De verdad, gracias por ser tan creativa. Eres una verdadera artista!! Very clever Karen,I like that idea. And I really like the eraser. Brilliant!!!! The pompom is a hoot!!! Do you have ANY idea how much I love this idea? Karen, you're ingenious !! Who doesn't love to come to "Tool Time Tuesday", my favorite thing about Tuesdays. Question - is it permissable to put your Tool Time Tuesday Logo (stamp) on my blog? Very clever. Do the sheets come in metal too so that magnets would work? 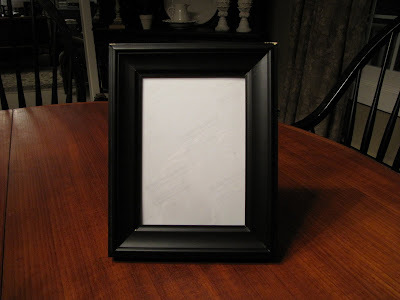 I guess that would be a good larger frame project to accommodate lots of notes. Home Depot must love when you pull up to their door! Too Too Clever!! Very good idea!! I may have to use that one! Great idea! Now I can make these as gifts for family and friends! That pom pom eraser is so cute! I don't know where you get these ideas, but I maintain my opinion that you are brilliant! What a cute idea... one for every room in the house and for my office at work! The pom-pom just puts it over the top. Love it! Clever idea and fun for a kids room too. I just love it when you post somethng and I just love your ideas. Thanks for being so creative. Karen...I just love your ideas!!! I have to make some of these!!! Seriously, if Home Depot knew what we quilters can think up for ideas, they'd be stocking fabric instead of shingles and paint. Awesome idea! I think it's something I'll try for sure! Another fabulous idea from the hardware store! 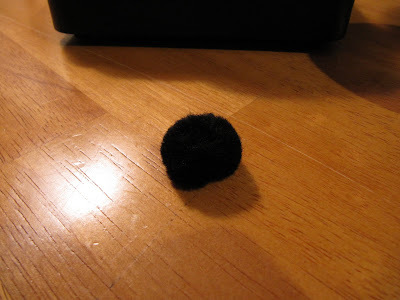 Love the idea of using a pom pom as an eraser. You should definitely decorate it as a Muppet! How fun! I was in Bunnings (local hardware chain) with my husband and he always goes down the retic aisle. He didn't like the way I was looking at the hose hangers... some of them were very pretty and I had visions of quilts draped over them for display... you have changed how I look at things! Karen, while I love the simplicity and utilitarian-ness of this project, my favorite part is the pom pom eraser! I'm making at least 5 this week!! Very cool. I've recently found your blog and have been going back through the older Tool Time Tuesday entries - some very nice ideas. Thank You! regarding this one, if you do use a permanent marker (by mistake or on purpose to decorate it), rubbing alcohol should remove the marks. Oh my, I am so happy my friend found you, your ideas are awesome. I love this idea,home depot here I come. 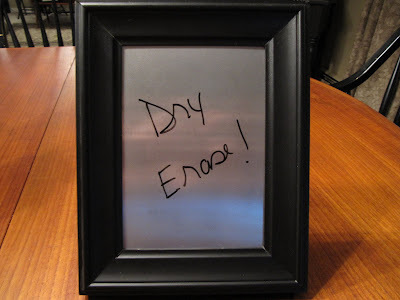 If you do have "ruined" dry erase board from either permanent marker or from dry erase left on too long, try scribbling with a dry erase marker over the offending area. I've seen it take off year-old Sharpie cleanly.